Overall Thoughts: This demon is poised to be a real powerhouse in Standard. 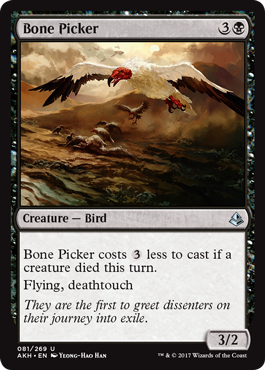 The fact that this puts a -1/-1 counter on each creature your opponent controls when you discard or cycle is huge. And a 5/4 flyer for 5 mana is nothing to sneeze at either. 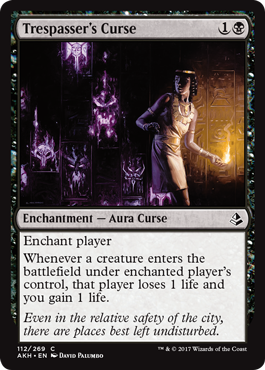 Overall Thoughts: A 4/3 for 3 mana is already pretty good, but tacking lifelink onto this makes this card even better. The ‘penalty’ of having to place a -1/-1 counter on one of your creatures is mitigated by the fact that black/green decks have lots of ways to utilize -1/-1 counters. Overall Thoughts: A 2/1 flyer for 3 mana is not good, and the ability to give this haste for one mana more doesn’t make it much better. 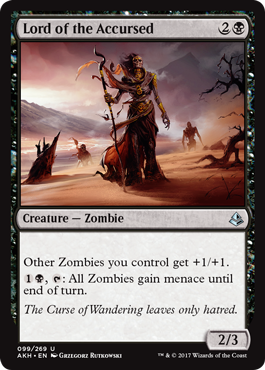 The only saving grace for this card is that it’s a zombie, so it might see a little play due to that, but I doubt it. 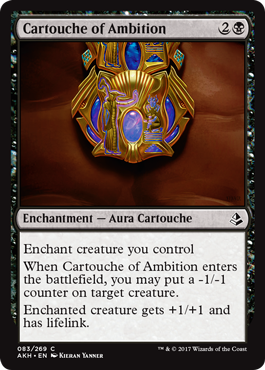 Overall Thoughts: With all of the -1/-1 counters flying around Amonkhet, a lot of the time this will only cost 1 black mana to cast. For that reason, I think this will be played a decent amount of the time. Also, being able to kill practically everything thanks to flying and deathtouch makes this a very capable blocker for you that you don’t mind dying. 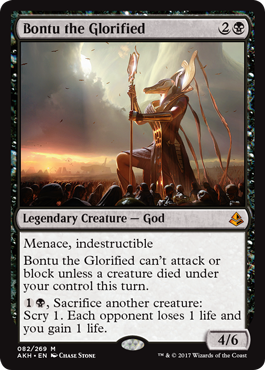 Overall Thoughts: As long as you can keep making a steady stream of creatures, Bontu can be a powerhouse. It’s tough enough to chump block a 4/6 turn after turn, but when it has menace suddenly there’s no good options for blocking left. Your opponent must decide to block so that they can kill Bontu or not block at all. That’s the perfect opportunity for a well-timed combat trick. Overall Thoughts: Getting a -1/-1 counter on any target creature, plus buffing your creature and giving it lifelink seems like a good deal for 3 mana. This card suffers from being an aura (like all of the cartouches do) and the usual baggage associated with them. Overall Thoughts: This is a good card to have in those long, grindy games. 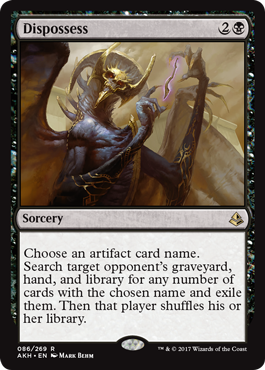 While it is expensive, I could see having this in my sideboard to play against those decks that draw the game out. 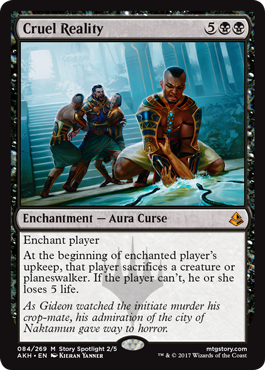 And, while your opponent may get their choice of which creature or planeswalker to sacrifice, against most decks that will still be problematic for them. This is also a good target for Aetherworks Marvel to hit. Overall Thoughts: This is good in a dedicated zombie deck, but probably won’t see play elsewhere. 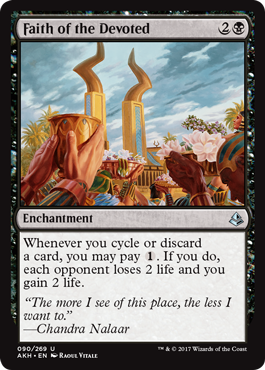 Overall Thoughts: Since Amonkhet will be in Standard the same amount of time as the Kaladesh block, I would expect this card to see some play. It’s a good way to make sure Dynavolt Tower, Aetherworks Marvel, Walking Ballista, and any troublesome vehicles don’t get to see play. Overall Thoughts: So you say you need a chump blocker for the next couple of turns. Well then, have I got a card for you. 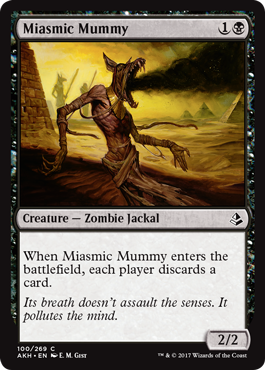 Seriously though, the only thing going for this card is that it makes a zombie, but I’m not even sure a zombie deck will want this. There’s likely a better option. Overall Thoughts: Even with the restriction of when it can be activated, being able to return creatures from your graveyard to the battlefield is nice, which means this card should see some play. Overall Thoughts: While it’s a great blocker, this card isn’t killing much of anything that it blocks. So, unless your plan is to stall the game for a few turns, stay away from this beetle. Overall Thoughts: While madness is still in Standard, this will be a really strong card. Cards like this make my mind start thinking of all of the possibilities this card offers. I imagine this will see plenty of play. Overall Thoughts: Even though this is a 1-drop, this card will still have a relevant effect in the late game. 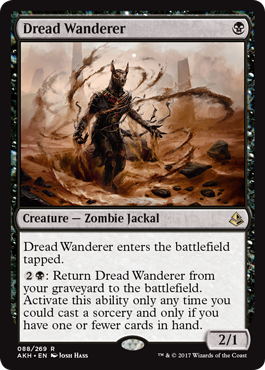 And it’s a zombie, so it’s likely to go into all of the zombie tribal decks. I like this card a lot. Overall Thoughts: While 5 mana is a lot, being able to exile (almost) any creature at instant speed is good. This takes care of all of those pesky creatures with embalm, as well as the zombies that return to the battlefield. If this cost 1 less mana, it would probably see widespread play, but as it is it’ll still be in lots of decks. Overall Thoughts: A blast from the past, gravedigger is good at what it does. It’s also a zombie for the tribal shenanigans you might try to pull off. It’s nice when a card from the past makes a return in a Standard set. This might see a little fringe play, but nothing widespread. 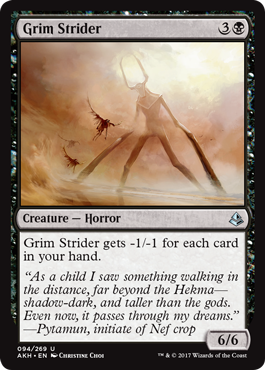 Overall Thoughts: I’m already imagining playing against this, thinking I have a burn spell that will kill it perfectly, only to have my opponent cast an instant from their hand which messes up the math and allows Grim Strider to live. And I’m already hating this card because of that possibility. 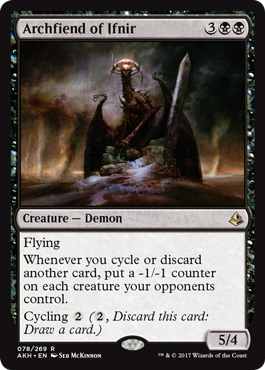 Overall Thoughts: The bonus this card gets from cycling or discarding allows this card to go from only being playable is a dedicated cycling/madness deck to being played in any deck that has a few cycling/discard outlets. That makes the world of difference. Overall Thoughts: This card reminds me a lot of Duress, but with different options to choose from. 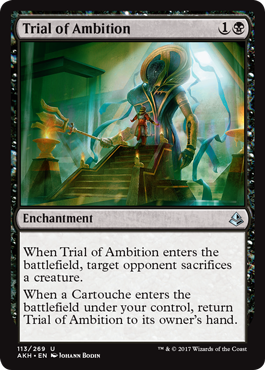 As such, it’s a good card that will see play to disrupt your opponent’s plans. 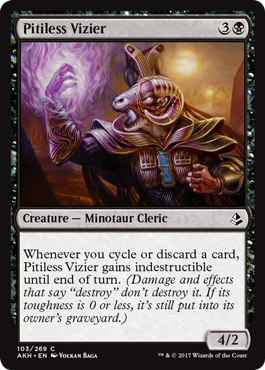 This is good protection against artifacts like Aetherworks Marvel or any creature you wish to deny your opponent. Overall Thoughts: Talk about synergy. All of her abilities flow naturally from one to the next and really capture the feeling of her being a necromancer. She also creates her own small army of zombies while working towards destroying all non-zombies. 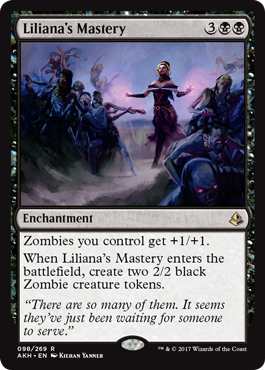 Liliana will definitely see lots of play in Standard and I think she might be the centerpiece of a new zombie tribal deck. 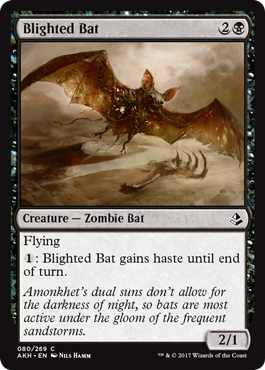 Overall Thoughts: In a zombie deck, this card is the bee’s knees. In other decks without as many zombies, it’s just okay. It is nice that the card gives you 2 zombies that get the bonus this card provides as an enchantment. Overall Thoughts: Here’s another card that’s great in a zombie deck, but won’t be played in other decks. 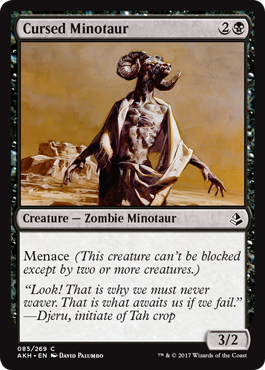 Granting all of your zombies menace might be the final piece of the puzzle that was needed for zombies to become top-tier in Standard. Overall Thoughts: If this only made your opponents discard a card, the rating for it would be higher. However this still may see some play in those zombie decks that also utilize cards that trigger when cards are discarded. It’s a lot of hoops to jump through, though. Overall Thoughts: Getting a 1/1 creature isn’t exciting in a world of -1/-1 counters and Walking Ballistas. This might see a little play in a deck dedicated to -1/-1 counters though. 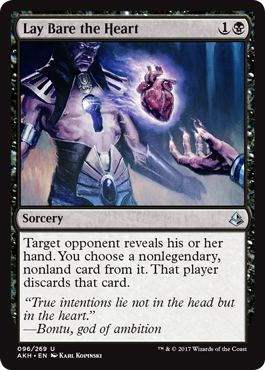 Overall Thoughts: Was Sign in Blood too powerful for this set, or did we just need another option for decks that aren’t fully in black? Likely will see a little play in decks that really need the card draw, but probably not much. Overall Thoughts: This card creates that interesting tension during combat when you don’t know whether to block this card for fear that your opponent will cycle a card (or somehow discard a card) to become indestructible and kill your blocking creature, or whether to just let the damage through. I like cards like that. Overall Thoughts: Talk about a great creature. In a zombie deck, you play this and place the -1/-1 counters on a zombie token, which then dings your opponent for 1 life. And a 5/4 with menace for only 3 mana is really strong. This card will see play. 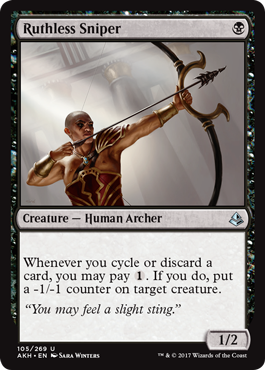 Overall Thoughts: An archer without reach? I guess it passes because it places -1/-1 counters on creatures. It is nice that it can place the counters on your creatures as well as your opponents, for those times you have creatures that want the counters. this is a neat design. Overall Thoughts: Does your opponent have cards in their graveyard that keep coming back to the battlefield? Then look no further! This card does exactly what you want it to do for the low cost of a black mana. And it cycles itself away if it’s not needed. This should see a lot of play. Overall Thoughts: While I think this is a cool card, I don’t think it will see much play. 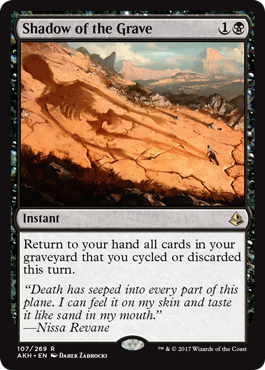 The only decks that will want it are decks dedicated to cycling, but they already have many ways to use up their mana over playing a card like this. Overall Thoughts: Here’s another card with a cool design. Do you place the -1/-1 counters on this card when it enters the battlefield so it can kill multiple creatures your opponent controls (by blocking and dying)? 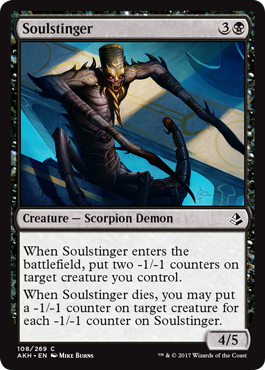 Or do you potentially weaken another creature of yours and have a 4/5 for 4 mana in play? Or just put this in a deck with creatures that want -1/-1 creatures on them. So many options. Overall Thoughts: This is a fun card that can really mess up combat math for your opponent. Or it can act as straight-up removal for 1 or 2 of your opponent’s creatures. This should see a decent amount of play. Overall Thoughts: There’s so much value on this card it’s not even funny. If you want 3 zombies, pay the 6 mana and create them. If you have other cards that benefit you when you cycle a card, cycle this for 4 mana and make only 1 zombie instead. Either way, it’s value. 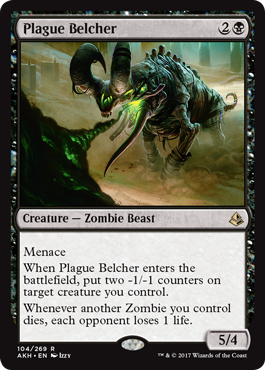 Overall Thoughts: The mana required for this is low enough that I could see this getting played in some Standard decks as a way to kill larger blocking creatures, in conjunction with fight cards, or as a way to protect an important creature from being destroyed. Overall Thoughts: What a great card to sideboard in against decks that attempt to go wide (by playing a lot of creatures or creating a lot of tokens). It even potentially playable in the main deck simply because it can come out early and seriously disrupt the way your opponent casts their creatures. Overall Thoughts: Here’s another good removal card for black. This card is much better if you have ways to bounce it or play it multiple times. 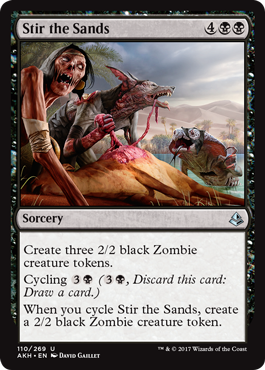 I’m sure this will see play in Standard even though the choice of which creature to sacrifice is your opponent’s. Overall Thoughts: There are a lot of cards that trigger whenever you discard a card, so you won’t want to play this against an opponent that has any of these effects in play. But if you’re the one with cards like this in play, you can always target yourself. 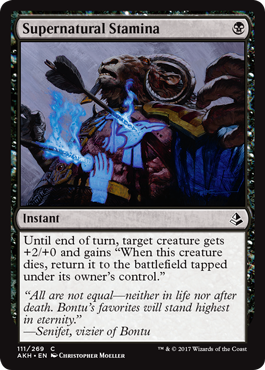 Overall Thoughts: The Never side of this card is a welcomed addition to Standard. 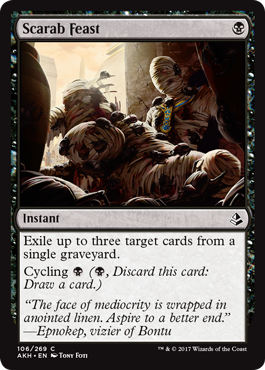 I love the fact that the Return side of the card can exile any card in a graveyard, so by playing this card and spending 7 mana, you can destroy an opponent’s Gideon and exile it from their graveyard all in the same turn. Or you can do it on consecutive turns. Either way, it seems really good to me. 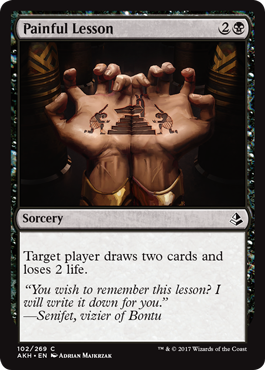 And that, my friends, is the end of my review of the Black cards in Amonkhet. Did I make any comments that you disagree with? Was my rating off from what yours would be on any cards? Let me know what you think by leaving me a comment below. 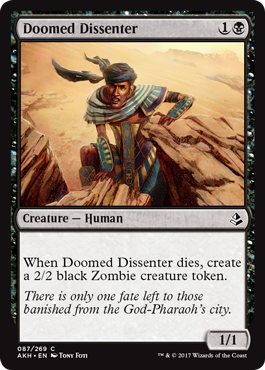 And be sure to join me again tomorrow when I review the Red cards from Amonkhet. I’ll see you then!